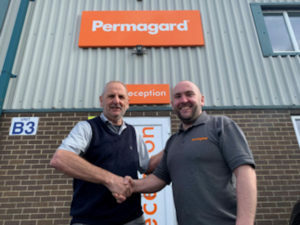 Avonmouth-based, independent damp proofing and waterproofing business, Permagard, celebrated its 30th anniversary on 27th March. Run on a simple business principle: the right products at the right place, delivered on time, Permagard has prided itself on fast, friendly and effective trading since it was first established in 1989 by founder, Dave Wookey. This family-run company began as a small trade business, a pillar of the Bristol community, providing innovative, high quality preservation products for good value. Over the next 18 years, Permagard went from strength to strength with Dave and his team inventing and patenting Easi-Fix, a mechanical wall tie as well as being one of the first companies to enter the cavity drain waterproofing membrane market. To mark their thirtieth year, Dave and his son, Steve, have refreshed Permagard’s look with a complete overhaul of the website, four new trademark registrations including; PermaSEAL and Easi-Fix, new signage and new stationery. Permagard is looking towards the future of the business and the exciting upcoming ventures; so after thirty years of running the company, Dave has chosen to hand over the reins to Steve who will lead the company forward for the next 30 years and beyond. Continually growing since 1989, Permagard’s great reputation is recognised on a national scale and due to such rapid growth, in 2007 it opened up its first ecommerce store; a huge step for both the business and the industry. However, growth and success didn’t mean that Permagard lost touch with its roots, its independent touch – efficient service with expert support for all – was, and still is, Permagard’s best known trait. Permagard is run as a simple straightforward business and doesn’t intend to change: the right products at the right price, when and where you need them.